How do you double the price of a Skoda? Fill it up with petrol! Have you got a wing mirror for a Skoda? Ok, seems like a fair swap! So the collection of jokes on Skodas continue, until that is, you read this altogether wonderful and (surprisingly) interesting book, Cars of Eastern Europe – The Definitive Story. For once having done so, you too, might glean a certain respect for the actual subject of such a derided quip as: What do you call a Skoda with a sunroof? A skip! Okay, so I was initially drawn to this book by its exceedingly fab, retro cover. That, and the fact that I live in Berlin, where Trabants made in the former GDR can be seen dotted around the city as a sort of regal remembrance to that once great divide between East and West. It wasn’t until I actually settled down to read through this most informative and comprehensive of books, that the world of the automobile, pronounced an entire new meaning. 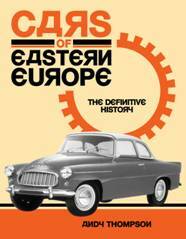 To be sure, lifelong car (and van) enthusiast, Andy Thompson, has herein written a very well researched chronicles on every type of East European vehicle imaginable. Its 409 pages will no doubt appeal to a variety of enthusiasts and kooky car buffs alike; as throughout, the author bequeaths readers with an array of historical facts, combined with each individual country’s economic situation and dilemma. Succinctly divided into chapters by country (Bosnia, Serbia and Slovenia, Bulgaria, Czechoslovakia, East Germany, Hungary, Poland and Romania), Cars of Eastern Europe – The Definitive History is awash with inviting photographs – old and new/colour and black and white. Thus prompting nostalgia, ridicule, amazement and ultimately, such interest that even my girlfriend had to actually read the book – instead of merely thumbing through its pages. Naturally, there are a number of dry facts and figures that may be considered essential for the car/motor enthusiast. We are after all, talking Haynes: yer car manual gods, so indeed, why not? In all, a very absorbing book, that is a sure-fire credit to Andy Townsend. Not only does it invite and inform, it also evokes and amuses. What more could you possibly want from non-fiction? This entry was posted in Miscellaneous and tagged Andy Townsend, Dacia, Lada, Motor Cars, Skoda, Trabants. Bookmark the permalink.